Trade analysis is one of the most important tools used by successful investors to pick stocks and make intelligent investment decisions. Trade analysis is one of the most important tools used by successful investors to pick stocks and make intelligent investment decisions. It enables an investor to prepare for the share market in advance and purchase stocks which can prove profitable when sold in the future. Pre-game trade analysis phase includes preparing for the trade beforehand. It includes research about the investment and the company’s background on the investor’s part. For an investor to successfully analyze a pregame trade phase, he would need to read different financial newsletters, screeners, watch news related to the share market, and hire a stock-picking service and a brokerage firm to advise him/her on future investment decisions. Once you have figured out what stocks you are interested in and which company you want to invest your money in, the pregame trade analysis becomes officially over, and you can move on to the next phase of trade analysis. 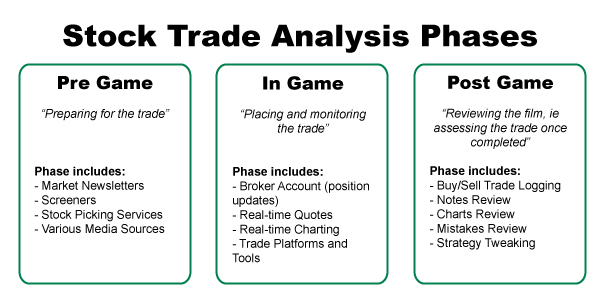 In the game phase of trade, the analysis includes everything your stockbroker provides you. Real-time market quotes, establishing stop-loss orders, limiting orders, and performing trade analysis are all examples of the in-game phase trade analysis. This phase also includes buying stocks after the pregame analysis, monitoring them on a regular basis to know when the price is higher or if the price is falling, and making a sell order based on the current market price of the investment. The post-game phase of trade analysis starts after an investor has sold the stocks he/she has bought in the second stage. It requires an investor to review the trade to find out what went wrong or what was done right during the trade. It also allows the investor to find faults in the current strategy he/she is using to make better investment strategies in the future. Reviewing a trade is one of the most vital parts of a successful investing career. It helps investors avoid committing the same mistakes in the future. 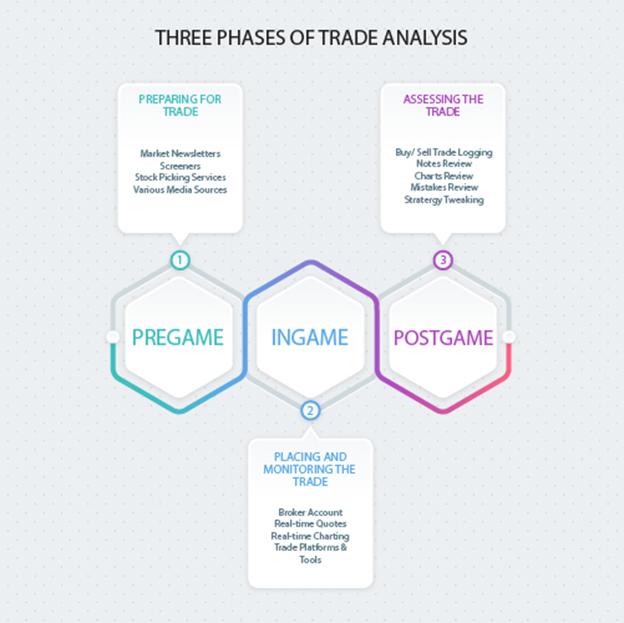 How to successfully implement the post-game phase of trade analysis? Save the trade details: Make an excel sheet of all of your investments with the date of purchase. Note down the ticker symbol, invested amount, the number of shares, the return percentage, and the return amount against each investment. Download the stock chart: Download the stock chart of all of your investments and mark the chart with buy and sell points alongside different trendlines, support or resistance levels, etc. After this, mark the chart with the trade information and save it to your computer. Write your review: Analyze your trades using the above information and write what you did right and what you did wrong on an excel sheet, a word document, or a piece of paper, and read it every time before you make a trade in the future. Once you are through with the three phases of trade analysis, you will come out as a successful investor in the long run. Always go through the three stages every time you make a deal in the share market as they are what makes an investor successful in this highly volatile and risky market.